A very similar storm will move into the Midwest early next week. It will come out strong, but weaken as it moves to the northeast. Amounts will generally be in the same ballpark. In fact, one computer model give Kansas City another foot or more of snow! Stay tuned for that. Computer models are starting to narrow in already. The red area is the cone of uncertainty But the track should stay confined to within this area. Exact amounts are impossible, this early. 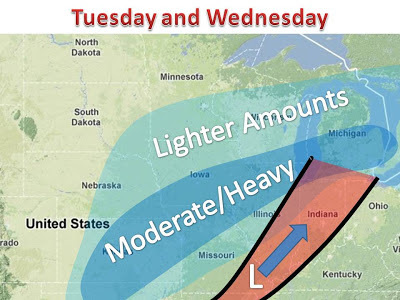 Furthermore, this system will hang around for a few days and will bring the chance of snow through Thursday!